While traditional international exchange programs provide valuable experience for engineering students, they are neither within reach nor practical for all students. An innovative course was developed and executed Spring 2007 to provide engineering students with an intense international experience. This course is aimed at strengthening ABET outcome item (h) [the broad education necessary to understand the impact of engineering solutions in a global, economic, environmental, and societal context]. Additionally, the course provides students the opportunity to practice contemporary, industry-relevant skills by exploring lean manufacturing, including tools, philosophies, and current literature. In the first offering of the course, fifteen students participated on kaizen teams at companies in the United Kingdom and the United States. 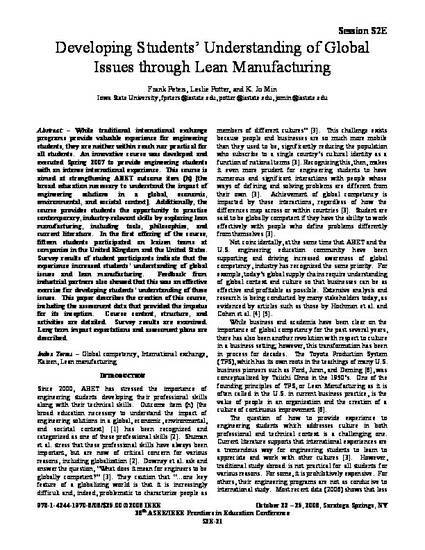 Survey results of student participants indicate that the experience increased students’ understanding of global issues and lean manufacturing. Feedback from industrial partners also showed that this was an effective exercise for developing students’ understanding of these issues. This paper describes the creation of this course, including the assessment data that provided the impetus for its inception. Course content, structure, and activities are detailed. Survey results are examined. Long term impact expectations and assessment plans are described. This proceeding is from 38th ASEE/IEEE Frontiers in Education Conference (2008): S2E-21. Posted with permission.